This is an essay which first appeared on Zoomorphic magazine. The onshore wind is insistent like toothache. Waves break on the beach in long curls of white foam, and dissipate on the sand and are sucked back into the blue-green water. 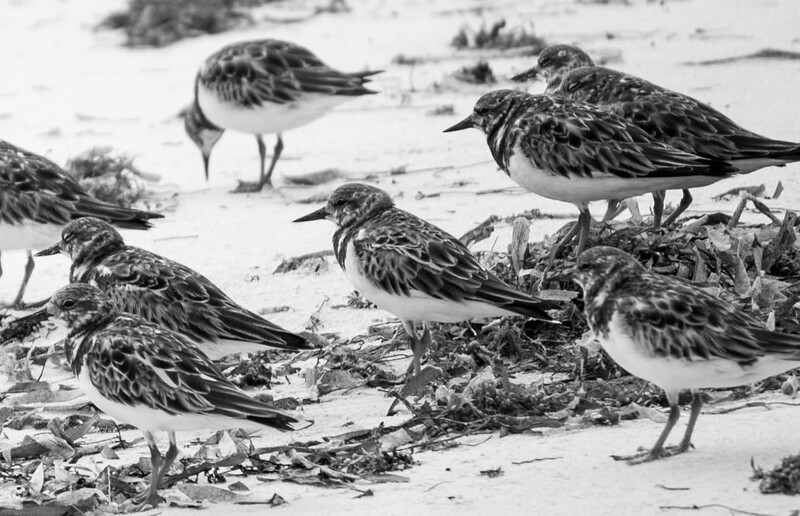 Sanderling and turnstone pick over weed the tide has strewn behind it, running before me in panic like peasants fleeing a raiding party, but resolutely refusing to fly. It’s a familiar scene, one I see almost daily on the beaches of North Norfolk. This, however, is not North Norfolk. As if to clarify this a pelican chooses this moment to fly into view. Unlike many of those beautifully streamlined diving birds – think tern or gannet – pelicans are big, bulky birds. With a laconic flight and a short, punchy dive, they turn slightly on their side before hitting the water with all the panache of a belly-flopping sumo wrestler. To be honest I didn’t expect to see species common to my local beach here on a Cuban one. There was a definite double-take on my part when I saw the first sanderling running along in front of me. But, as I discovered later, there are also dunlin, sandpiper, turnstone and whimbrel here. There are different subspecies, such as the ruddy turnstone, to some of those we have at home, but it is still remarkable to me that here, in thirty-degree heat, with a mangrove swamp a few hundred metres away, there are the same birds doing the same things as there are four and a half thousand miles away on a Norfolk beach. The beach that is before me now plays out a gentle curve which is whittled down to a point like a sharpened, smoothed piece of wood and at its tip is the mangrove swamp. I leave the beach here and wade out through a belt of thickly stinking mud and sargassum weed. It seems collected here purposely by a malevolent tide to keep me from reaching my goal. The water is mostly waist deep, but rises to my chest once or twice. I fight with the mud, sinking to my ankles. A bird as big as any I have ever seen launches itself from the mangrove edge and takes to the wing with deep, floundering effort. Whether it is its closeness, its unnatural-seeming whiteness, or the fact that I am used to seeing its smaller cousin the little egret that make it seem so, the great egret seems like a pterosaur. After twenty yards or so the mud gives way to a mixture of bone-white sand and darker patches of turtle grass whose fronds beckon the tide on. The sea shallows to between thigh and ankle depth. Crabs gesticulate wildly with their claws like Latin housewives berating their husbands, and scoot away leaving a puff of sand like an exaggerated cartoon effect. I’m here on these sand flats for the first time ever to fish for bonefish and permit, but for now I’m bewitched. Luminescent wavelets harvest the sun’s rays like sheaves of golden corn, then sow them on the sand below in shimmering fields. Their never-ending kinetics scribe themselves onto my retinas, so that when I look away I still see the motion of them superimposed over my vision. Glossy ibis and little blue heron stalk the shallowest water. Royal terns with dark frowns pass me on the wind, and above them frigate birds cruise. A stingray melts across a bare patch of sand with a heat I am wary of, but passes me by gently, benignly even. I wander the flats in a carefree dream, wading amid the green sea, with the blue sky hinged above. These sand flats and mangroves are extensive. If I followed them along the coast of Cayo Coco, the island on which I am staying, and then Cayo Romano and Cayo Paredon, there would be thousands of acres of them. 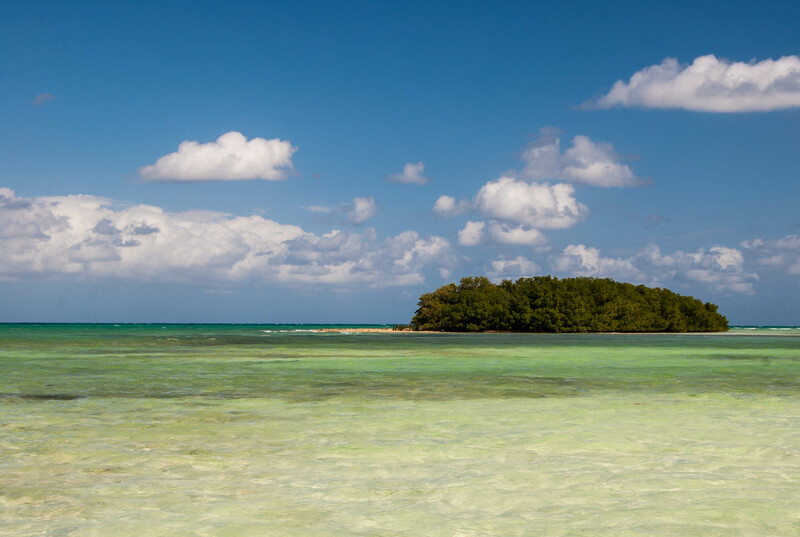 Before the roads, before the hotels, before the seventeen-mile causeway from the mainland, before the international airport, this archipelago that stretches along the bent back of Cuba’s main island was uninhabited. Huge flocks of flamingos blushed the lagoons and mangrove edges, but the airport and the increased activity of tourism displaced them to more remote areas. Worryingly I am told there are already foundations in place for hotels on the currently still uninhabited Cayos Romano and Paredon, as well as those already half built here on Cayo Coco, and further North at Pilar beach. How much further can the pelicans be displaced? Beyond a small mangrove-encrusted island that is like a dark green jewel set in a shimmering surround, the colour and mood of the sea changes from the benevolent blue-green of the flats to something deeper, darker, denser. I sometimes dream of being lost in a blank ocean, treading water over the black unending depths with the unknown and the unnameable somewhere below, and I think of this now as I look out across the ocean; out to where the Gulf Stream wells North as if pulsed by the ventricles of the earth itself. The locals wade the kilometre or so out to this island to fish and gather conch shells. Some of them wave cheerily to me, and shout in Spanish, pointing to the island and indicating with outstretched arms what I presume to be the size of the fish that are to be found there. Life is a day to day struggle for the Cuban people. It is not a nice feeling to know the rod and reel I am fishing with are worth many months wages to the average Cuban. On a tour of the mainland later in the week our guide Laurie tells us he is a professor, and spent five years at university. He earns more in tips now than he did in wages as a teacher, but he still asks if we have any extra toiletries we can leave him when we go home because the shelves are often empty of everyday items. Because of this jobs in the tourist industry are highly sought after. My conscience struggles with the fact that though my being here is helping to provide well-paid employment, is that sufficient reparation for the crippling, spiteful economic embargo the US, and us as her ally, have enforced for decades? As an Englishman who is not altogether proud of his country’s history, or its exploitative colonial past, I believe it is important for us to engage with cultures and populations that have suffered at our hands historically. There is undeniably an element of exploitation where tourism in poorer communities is concerned, but without it there would be almost no interaction between the people of Cuba, and the people of countries such as our own. And according to the World Travel and Tourism Council, tourism accounted for almost ten per cent of GDP in Cuba in 2013. Where people’s livelihoods are concerned, my Western sentiments seem slightly hypocritical: if your children are hungry it must be difficult to care about whether some birds have to move. As a tourist myself who am I to pass judgement on whether or not tourism is ethical? Cubans are still of the land in a way we can only remember through pastoral-tinted glasses, and costume dramas. The industrial revolution was kicked into touch with the successive boots of the revolution, the economic embargo, and the collapse of the old Soviet Union, from whom Cuba used to receive much aid. Facts like this, and the enthusiasm of guides such as Laurie will, I hope, keep at least some of the island pristine. On the walk back in to the beach I stay even closer to the mangrove trees because the mud is not as deep. Their exposed roots are countless thousands of intertwined fingers reaching down to the underworld and passing three environments – air, water and mud – on their way. Juvenile fish scatter like handfuls of leaves flung by a child onto an Autumn wind; the mangrove is the perfect nursery. Unseen birds with exotic, unfamiliar song call from deep within the maelstrom of roots, branches and leaves like sirens tempting me in. There is the overwhelming feeling of a blizzard of life contained within. Because I am partially hidden amongst some of the outermost mangrove foliage the osprey doesn’t see me. It arcs overhead like lightning, and plunges in an unsuccessful strike mere feet from me. I am so close that as it lifts itself from the sea and pauses mid-air to shake like a wet dog, I see each individual drop of sea water flung from its feathers. There is somehow a split-second reciprocal meeting of eyes: the one a flaming fierceness of orange, the other an acquiescent yielding to a beauty complete in its wildness. It is something I replay over and over in the slow-mo, high definition of my memory; something that will always connect me to this place and this landscape and its cauldron of life. Also ingrained in my memory is the graphic vividness of the landscape. Its energy is contained in its colours as much as its wildlife: the lucid sea, blue-green and restless, the white sand under foot, the sapphire sky above and the yellow-gold sun held within it. The individual colours are as separate from each other as utterly and naively as they are in a child’s painting. By the time I have walked the mile or so back along the beach to the hotel, with a brief pause at the beach shack selling cold beer and grilled lobster, day is ending. There are no long evenings evocative of an English Summer here. By five ‘o’ clock the shadows of the palm trees are draped across the sand like the limbs of languid sunbathers lingering in the last of the sunlight, and by six the dark queen that is night in the tropics reigns. Frogs bat their croaks repetitively back and forth between palm trees and across the darkened pool. Later, in the hotel bar, a black-haired Cuban girl sings in French and Spanish with the heavy-lidded sensuality of a faded black-and-white era; an era before the revolution, when Ernest Hemingway drank daiquiris in La Floridita, and cruised these very islands in the stream on his boat the Pilar. The Wash and the Jardines Del Rey may be more than 4000 miles from each other, but their fates are entwined on many levels. We do not live in isolation here on our own archipelago – much as some believe we should – and our wildlife and countryside does not either. Its biodiversity is linked to that of Europe, the Caribbean, Africa and the rest of the world, whether that be by migration routes, or the ability some species have to live in divergent landscapes. Just off Cuba’s shores lies the Sargasso Sea. The only sea without any coastlines, it is bordered by four currents: the Gulf Stream to its West, the North Atlantic Current to its North, the Canary Current to its East, and the North Atlantic Equatorial Current to its South. The Sargasso is the breeding ground of Anguilla anguilla, the eel we are used to seeing here in the UK. As leaf-shaped larvae called leptocephali they drift across the Atlantic on the Gulf Stream, metamorphosing into the more recognisable elver or glass eel, before migrating up our streams and rivers. Once they reach maturity they retrace their journey back to the Sargasso. The eel and its remarkable journey are just one example of nature’s ability to cross the borders that we have imposed upon ourselves. Our climate is driven by these same currents. The ocean conveyor belt is a global system of currents linking ocean to sea, and sea to ocean. Dependent on water temperature and salinity, it is the never-ending flow of countless gallons of sea-water that interconnects our seas with those of the tropics and the poles. But there is also an interconnectedness amongst those of us who believe, as per the Ramsar Convention statement on wetlands, that we are dependant upon our natural environments, and the millions of species found within them, just as they are dependant upon us. When an extinction occurs in Africa or the Arctic, we feel it here in England; it is a wave formed by the calving of an iceberg that reaches every shore on the planet. Seeing a small, unobtrusive and quite ordinary bird going about its business on a beach in Cuba, at the same time as an exact copy is doing the exact same thing on a Norfolk beach, symbolizes the importance of nature to me as one living, breathing entity. Whether the Ramsar Convention will prove strong enough in the face of corporate growth to protect either the Jardines Del Rey, or the Wash, is something that concerns us all, even though most of us still have our heads either in the sand, or on our own personal crusade. The current détente between the US and her near-neighbour Cuba means, according to one estimate, that 10 million American tourists are on their way to Cuba’s shores quite soon, more than tripling current numbers. This, and the dismantling of the embargo, will be like a shock from a defibrillator to the ailing heart of the Cuban economy. In the face of that overwhelming economic energy I fear treaties such as Ramsar are going to need an awful lot of shoring up. Whether home or abroad these environments and habitats are essential for our survival as a species. While that may be the ultimate incentive for ensuring their continued protection and betterment, our responsibility lies equally to other species as to our own. Unfortunately, much of the world is neither watching, nor listening.